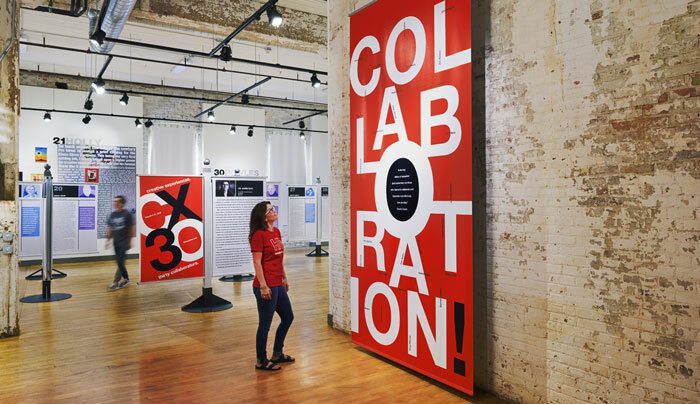 Visitors to CX30: Creative Experiences, Thirty Collaborators – a celebratory exhibit honoring helveticka's 30 years in business – were greeted by a 6' x 12' banner featuring the names of 30 collaborators important to the firm's success over the years. 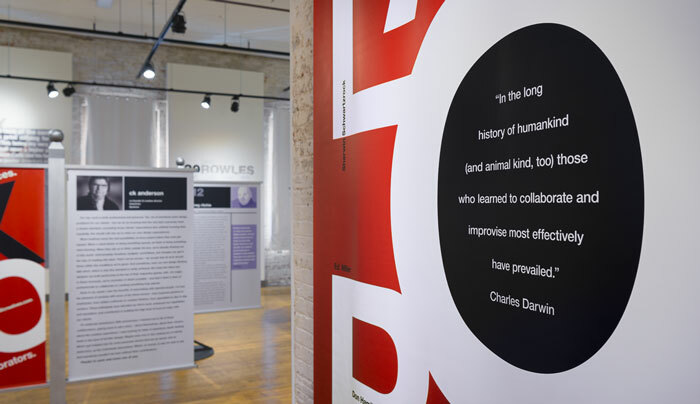 A quote from Charles Darwin (apocryphal, but too good not to use) set the tone for the exhibit. Introductory panels by helveticka's co-founder and creative director, CK Anderson. 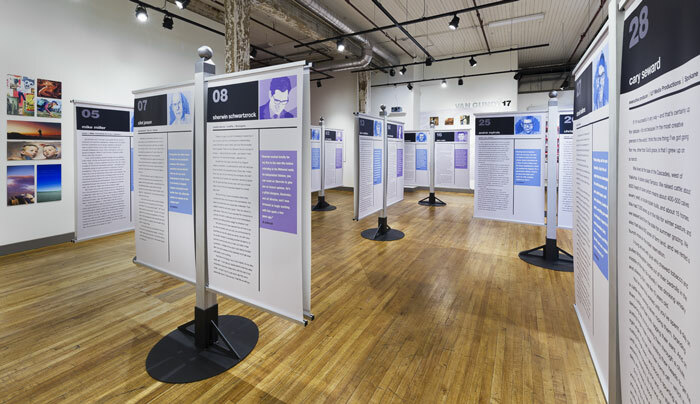 Vinyl banners, each printed with a story by one of the exhibit's 30 collaborators, were suspended within custom-fabricated display stands. 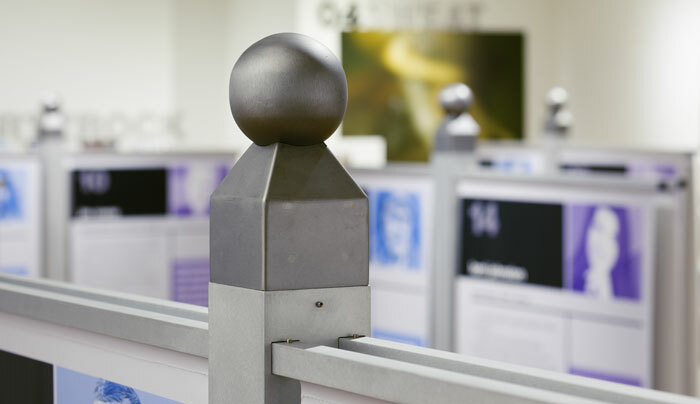 The 6.5' aluminum display stands were capped with steel finials. 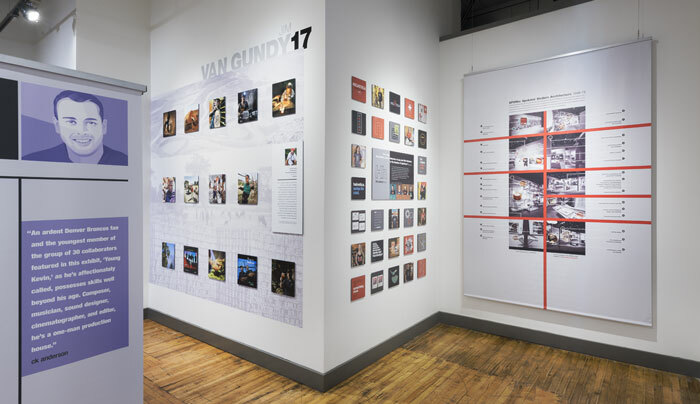 The perimeter of the gallery was lined with select collaborators' work, along with descriptive panels. 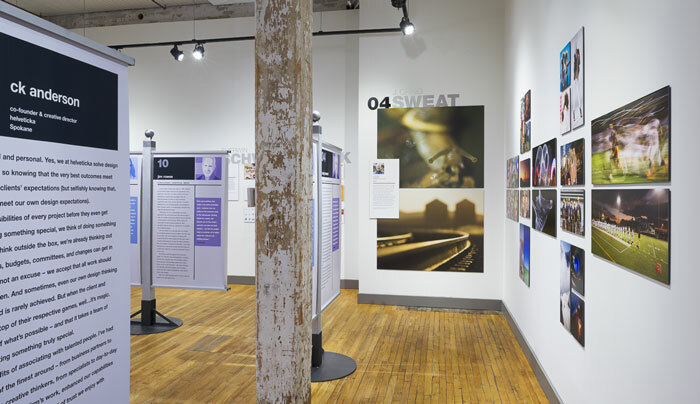 Visual art was also part of the exhibit, and included the work of photographers, illustrators, cartoonists, and graphic designers. 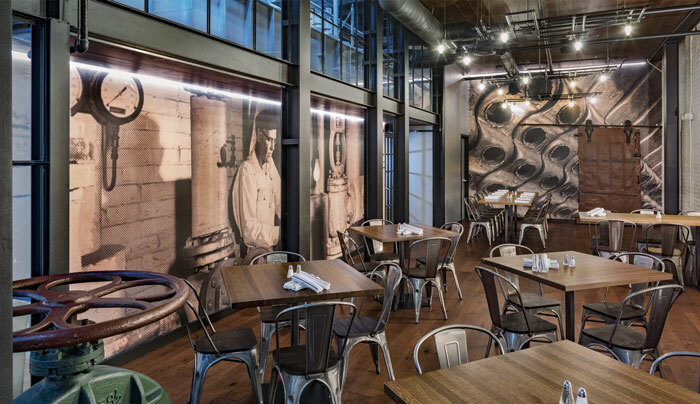 The Steam Plant's 2017 renovation included interiors by Spokane-based HDG Architecture and complementary graphics by helveticka. 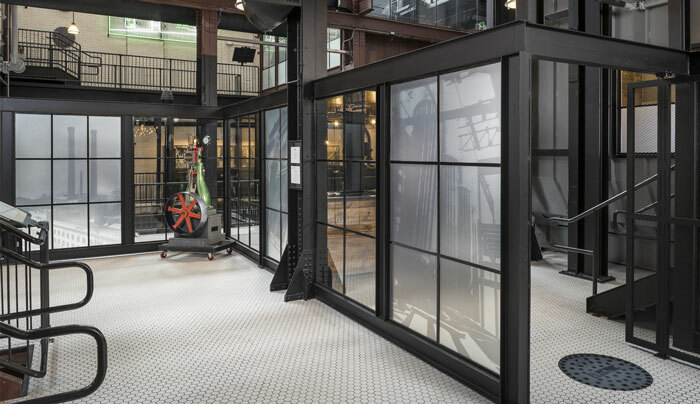 Working with HDG and the Steam Plant team, helveticka created cut-vinyl window graphics to identify individual spaces. 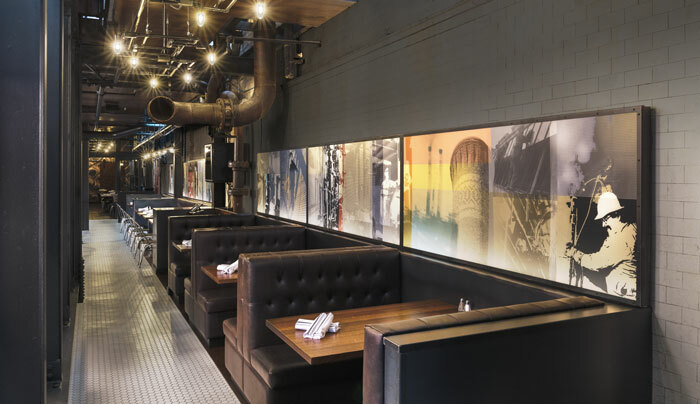 Archival imagery, backlit with adjustable LED lighting, was added to the dining area to remind patrons of the building's industrial roots. 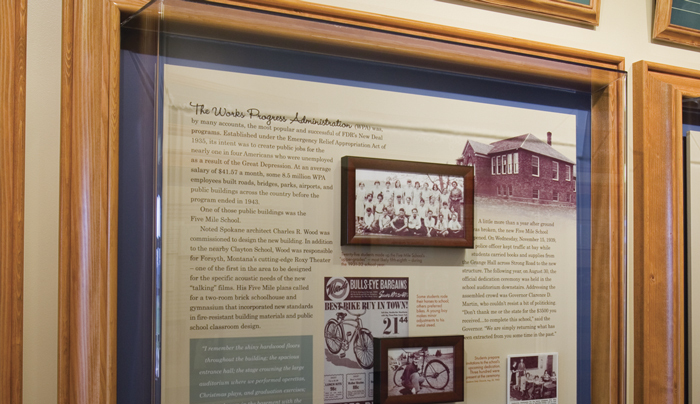 The archival imagery, treated with posterized and half-tone graphics, was printed on vinyl, mounted on Plexiglas, and encased within a custom frame. 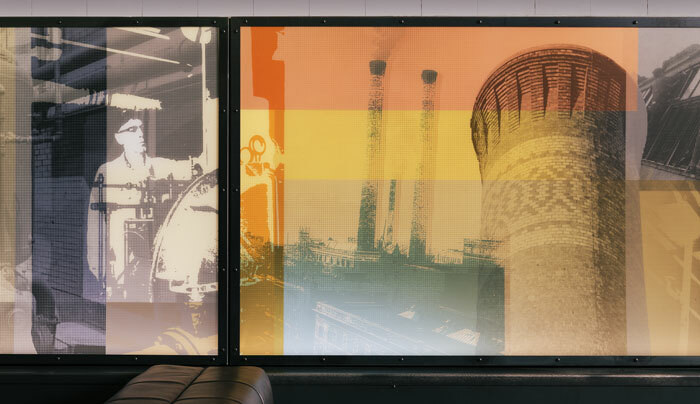 Photographic murals – with a half-tone overlay – adorn the walls of the Centennial Room, one of the Steam Plant's event spaces. 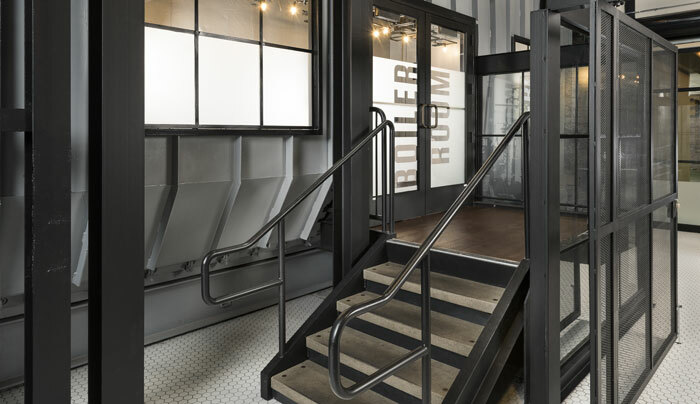 Private booths in the bar area feature a set of three historical photos accompanied by a typographic treatment. 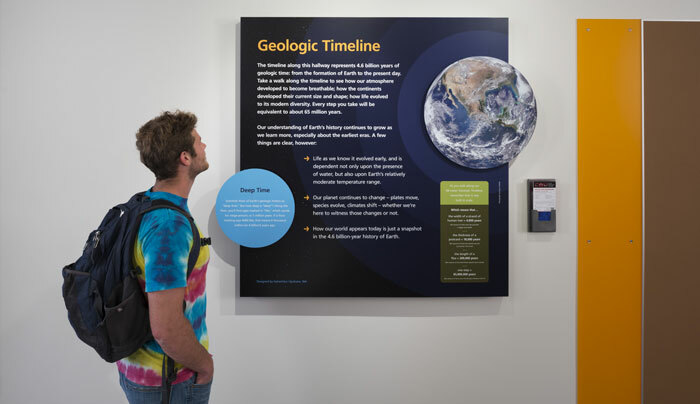 In collaboration with Integrus Architecture, helveticka created a geologic timeline for CWU’s new Science II building, which opened to students for the fall 2016 quarter. 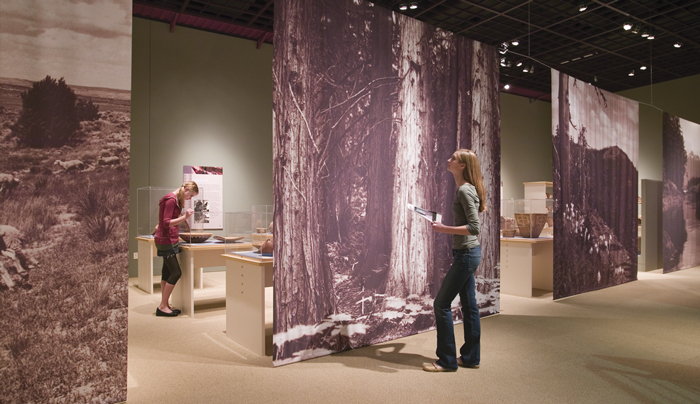 The exhibit maps to an actual scale model of the timeline built into the floor of a 58.5-meter-long corridor. 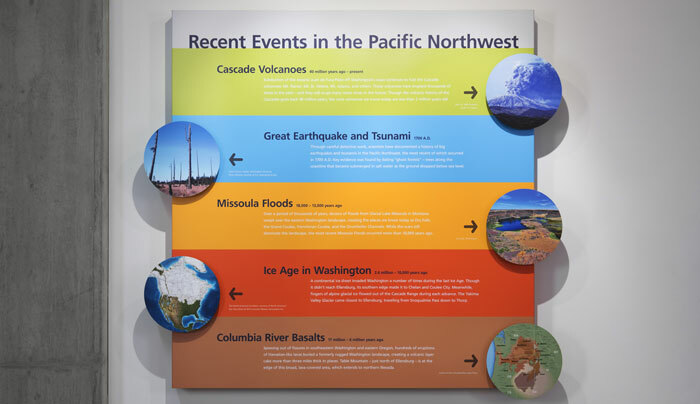 helveticka’s design team worked closely with CWU faculty members on panel content. 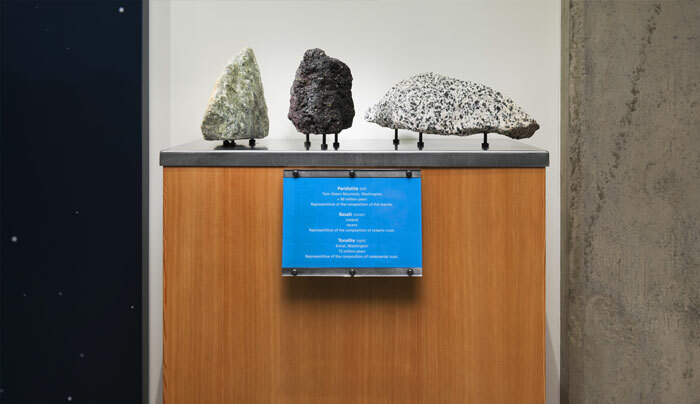 Eight custom-built display cases house rare rock samples from around the globe – and, in the case of a meteorite slice, from outer space as well. The cabinets were finished to match existing building casework. 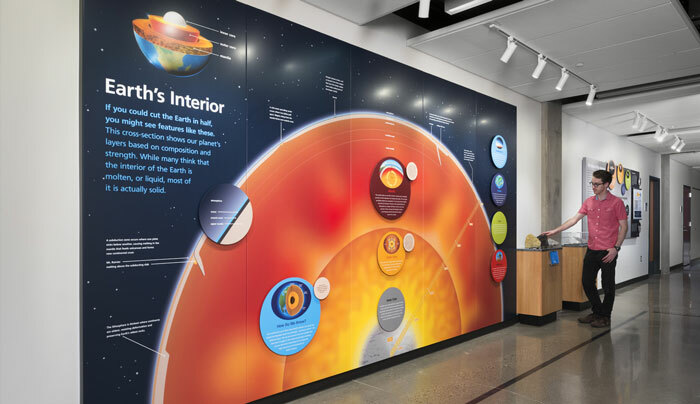 For the “Earth’s Interior” section, eight-foot-tall digital graphics were mounted onto custom-fabricated metal panels. helveticka also performed installation services for the exhibit. 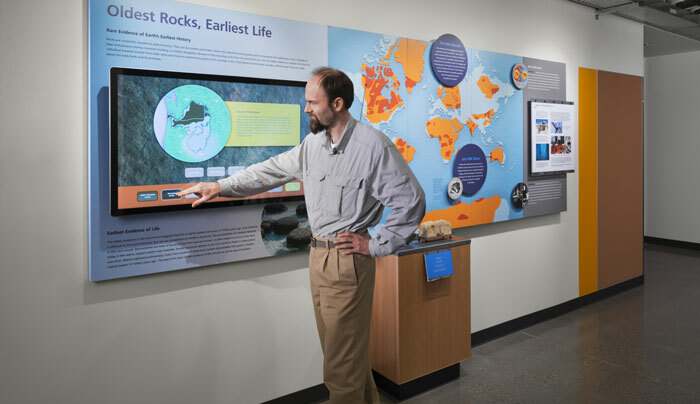 A pair of touchscreens – with content designed and programmed by helveticka – help round out and localize billions of years of geologic history. helveticka worked with the architects to select and locate the display’s lighting system. 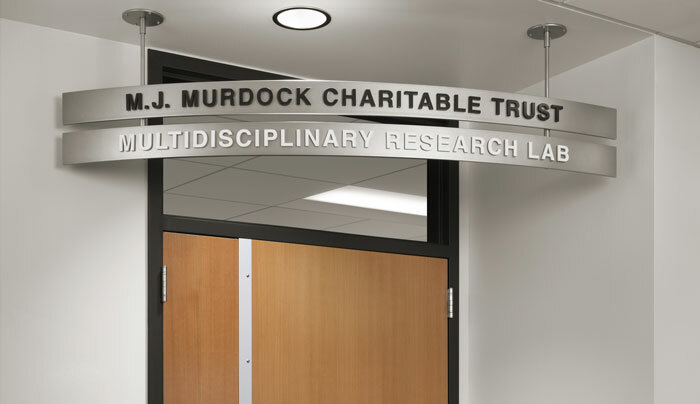 2' x 2' Plexiglas panels (far right) enable students and faculty to change and update related subject content. 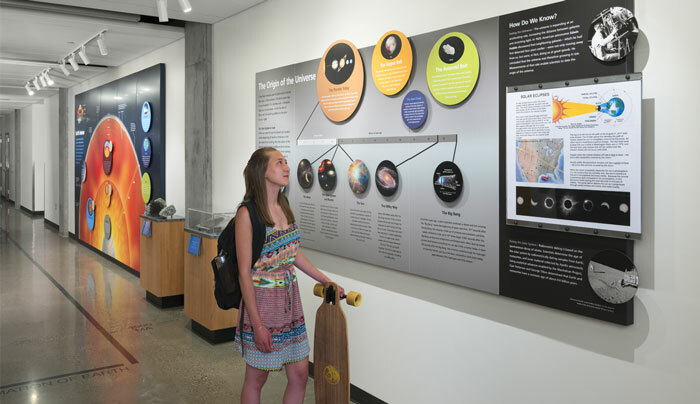 The exhibit is designed for prospective students and their parents, touring K-12 classes, and even current students – whether science majors or not. In addition to the geologic timeline, helveticka was asked to develop a donor recognition system to acknowledge sponsored classrooms and labs. 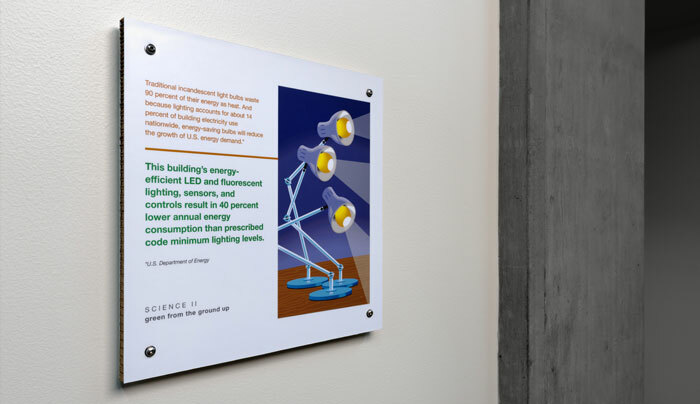 Throughout the building, a series of 15 signs explains the efforts undertaken by CWU to achieve Leadership in Energy and Environmental Design (LEED) Silver certification from the U.S. Green Building Council. 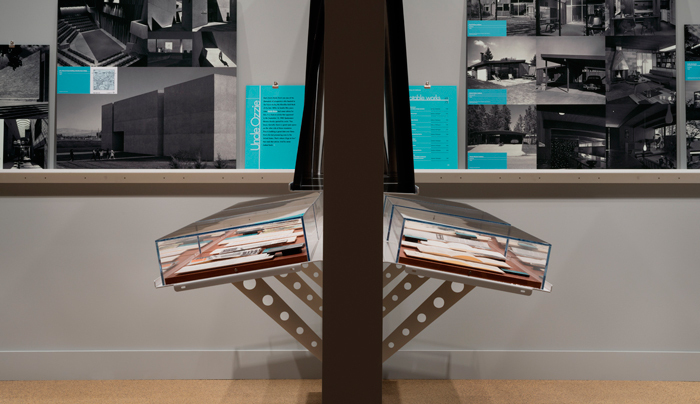 SPOMa: Spokane Modern Architecture, 1948–73 opened March 2, 2013 for a scheduled 10-month run at the MAC. 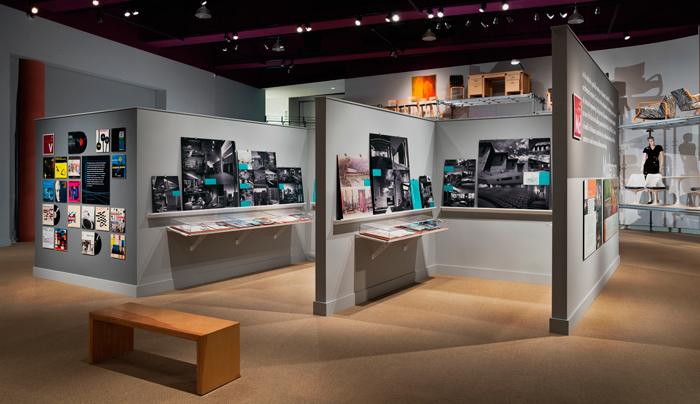 In addition to nearly 400 photographs of some of the finest Mid-Century Modern architecture in the Pacific Northwest, the exhibit features art, furniture, and music of the era. 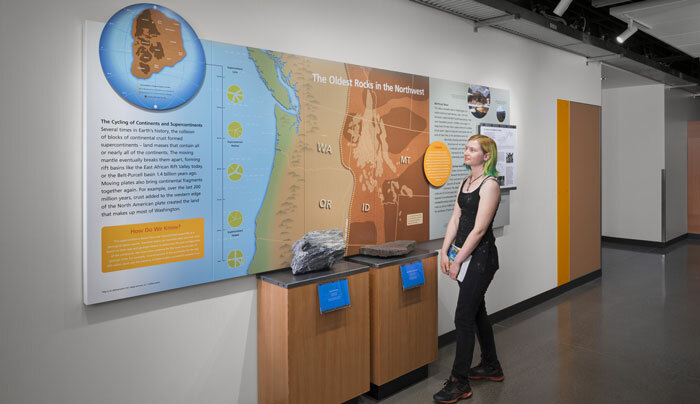 Custom display systems and clever mounting hardware keep the look and feel of the exhibit as streamlined and as minimalist as the architecture itself. 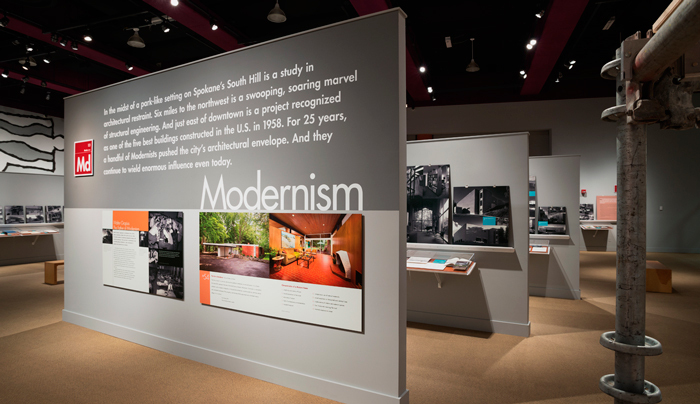 Complementing an exhibit in the Northwest Museum of Arts & Culture’s main gallery was a short documentary film chronicling the history of Spokane’s Modern architecture movement. 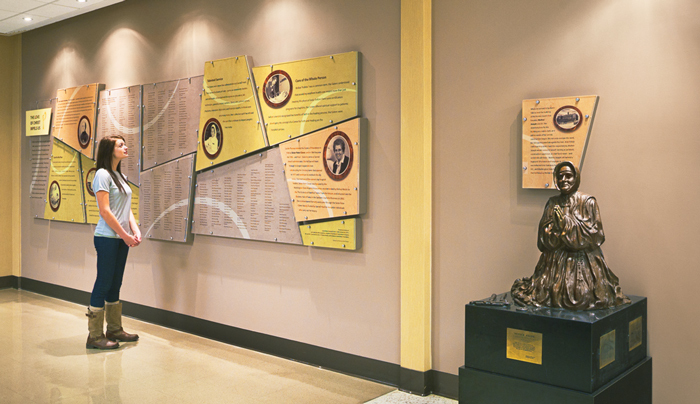 A 22-foot-long display honoring Spokane's Sisters of Providence is made of custom-fabricated aluminum panels featuring the names of every Sister who served over a 125-year period. 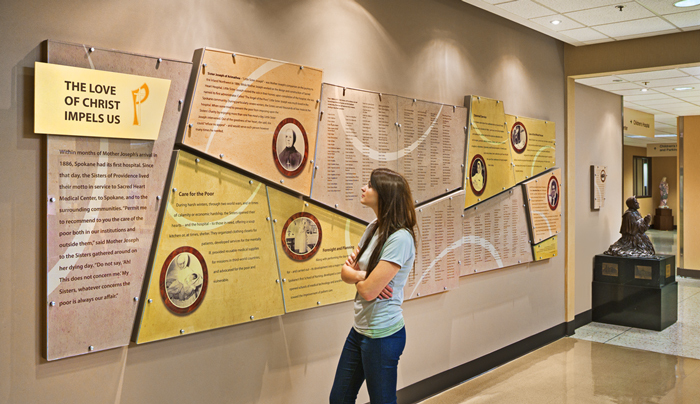 In addition to more than 400 names, the display features archival images printed on the powder-coated aluminum panels. 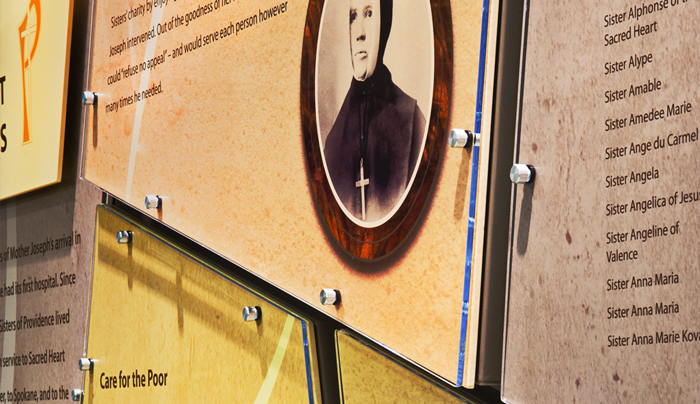 An existing sculpture of Mother Joseph, who established Sacred Heart Hospital in 1886, was included in the display. 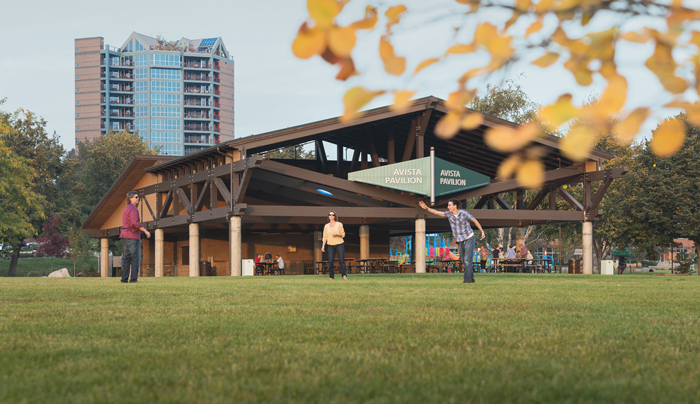 Funded by Avista, the grand pavilion at Coeur d’Alene’s McEuen Park can accommodate up to 200 people and is available for private rental. 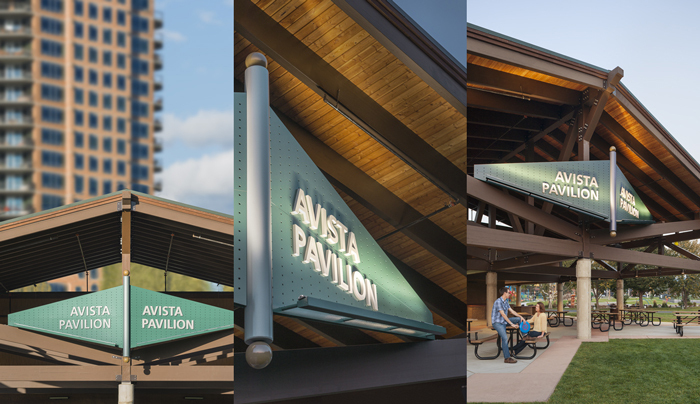 helveticka designed the pavilion’s 27’ x 8’ LED-lit and powder-coated aluminum sign; long-time collaborator Hydrafab Northwest built and installed it. 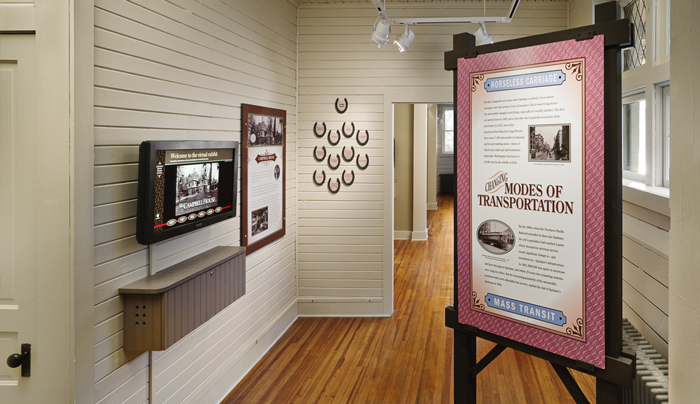 The Campbell House Visitor Center is located on the main floor of the Campbell’s carriage house, and features an interactive experience and short history built around the museum’s historic turn-of-the-century home. 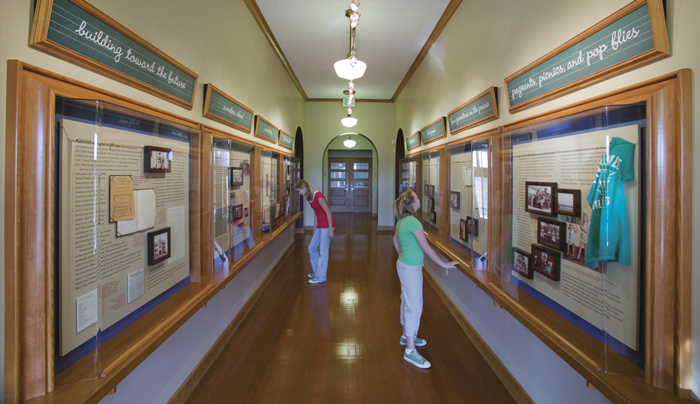 The three bays mimic what was likely the stable’s original configuration of the stables, housed in this space over 100 years ago. 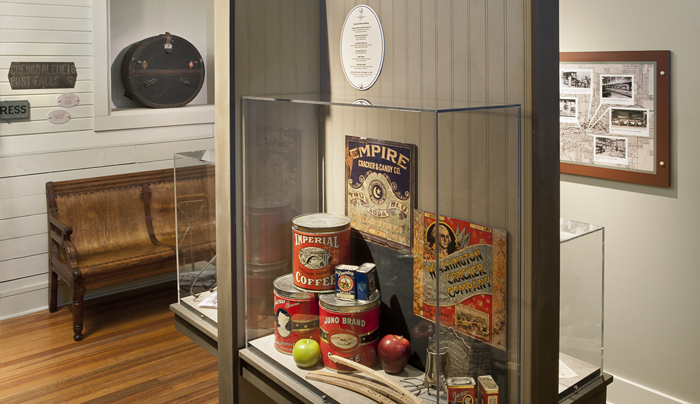 One of the three custom-built display units used to house museum objects and ephemera. 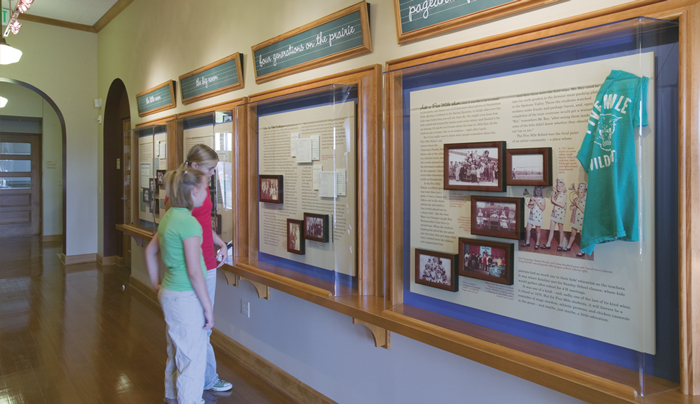 An interpretive exhibit sharing the history of education on the Five Mile Prairie north of Spokane, The Schoolhouse Gallery is housed within the 1939 Five Mile School. Hand-crafted casework complements the interiors of the schoolhouse; faux chalkboards and a script-style font add whimsy. 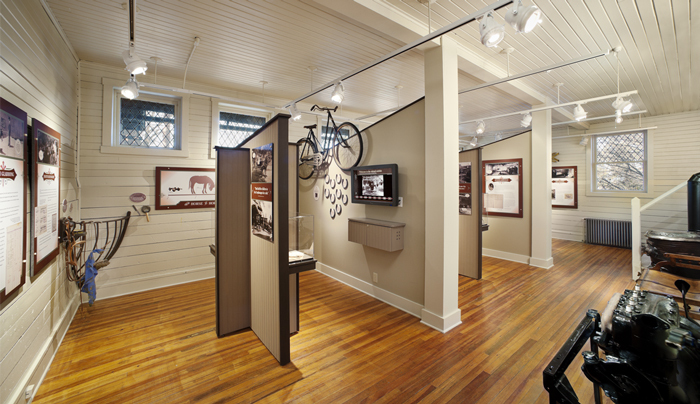 Ephemera like report cards and progress reports helped to humanize the exhibit while supplementing the narrative. 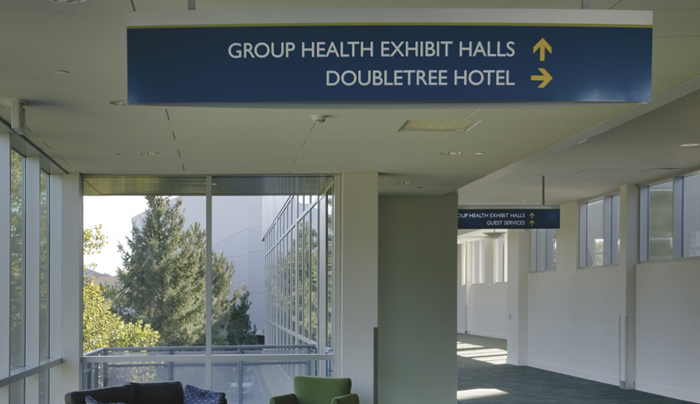 The signage and wayfinding system for Spokane’s $89 million Convention Center expansion required more than 600 signs to help visitors find their way around the campus. 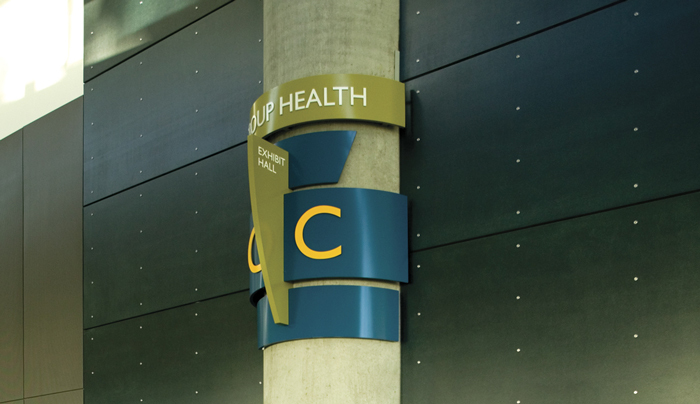 Signage for sponsored exhibit halls is wrapped around existing concrete columns. 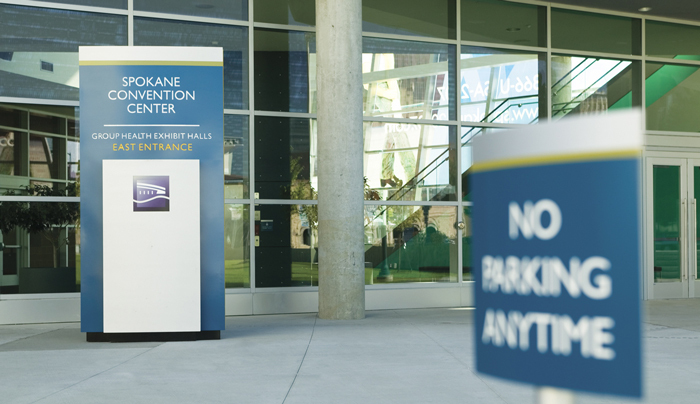 Visitors are oriented at the promenade that joins the original convention center with the recent addition. Bringing to light 100 American Indian baskets from a collection of nearly 3,000, Fibers of Life demonstrated both the beauty and the utilitarian aspects of the weaver’s art. 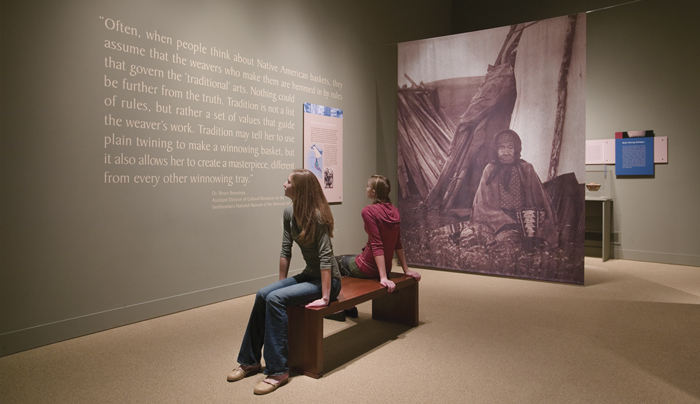 The space was designed to promote contemplation and reflection. 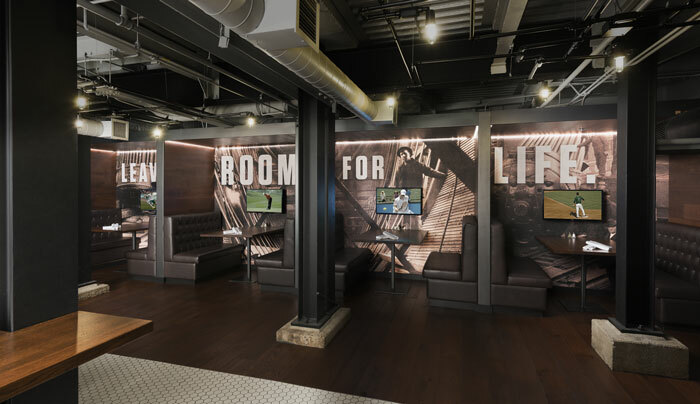 Suspended photographic tapestries, each 10' square, provided a sense of place while creating a separation between the baskets and the introductory area. 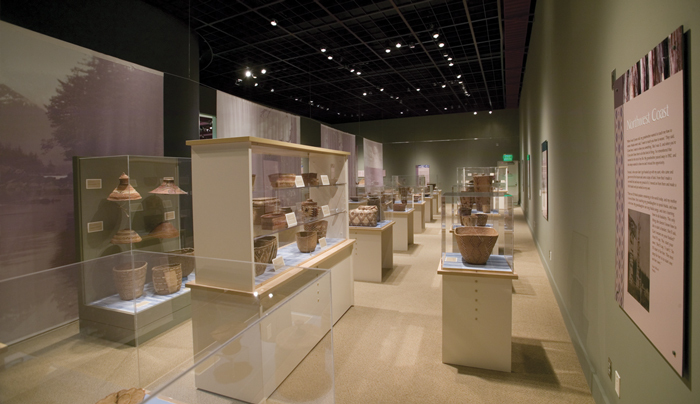 The density and arrangement of the exhibit evoked the intricacy of the basket patterns themselves.